Photo Of Clinton, Suu Kyi, Says It All : The Two-Way It speaks volumes about the purpose and meaning of the first visit to Myanmar by an American secretary of state in more than five decades. Aung San Suu Kyi is a living symbol of the struggle there for human rights and democracy. Secretary of State Hillary Rodham Clinton and pro-democracy leader Aung San Suu Kyi at the U.S. Chief of Mission Residence in Rangoon, Myanmar, earlier today (Dec. 1, 2011). Sometimes a picture does indeed tell the story. 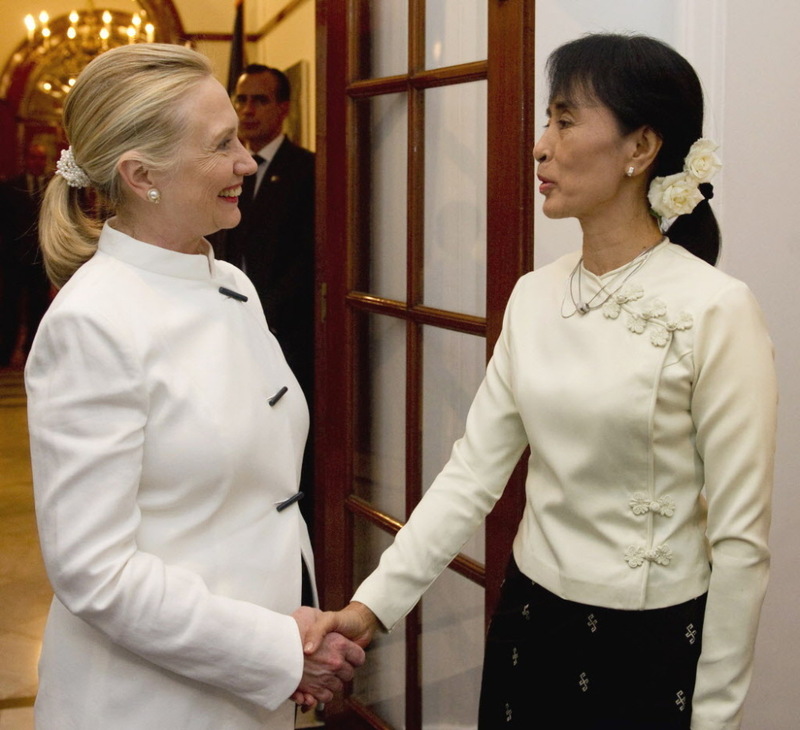 In this case, a photo taken today when Hillary Rodham Clinton had a private dinner in Myanmar with Nobel Peace Prize laureate Aung San Suu Kyi speaks volumes about the purpose and meaning of the first visit to the country by an American secretary of state in more than five decades. The U.S., Clinton says, wants to encourage Myanmar's "beginning steps" toward reforms that lead to respect for human rights and democracy. And there is no bigger symbol of the struggle for human rights in Myanmar than Suu Kyi, who spent 15 years under house arrest. Now, she's been encouraged enough by a new government's reforms to run for office and to tell U.S. officials that it was time for someone such as Clinton to come and try to push the reform process further along. Today, the women met for the first time. NPR's Michele Kelemen is traveling with Clinton. She'll have more about the secretary's visit on All Things Considered. Click here to find an NPR station that broadcasts or streams the show. Later, we'll add the audio of her report to the top of this post. NPR's Michele Kelemen reports that Secretary of State Hilary Clinton said the talks with Myanmar's President Thein Sein were "substantive, candid and long." Clinton said Thein said he was committed to "reform, reconciliation and economic development for his country." Clinton is "holding out prospect for upgrading diplomatic relations" between the two countries, reported Michele. But Clinton was also cautious. She said Suu Kyi's presidential campaign is "encouraging, but not sufficient." She said in order for there to be deeper reform all political parties must be allowed to open offices across the country.